Big data can answer questions and open doors. But for those still stumped we’ve broken it down for you. There are three defining properties that can help break down the term. 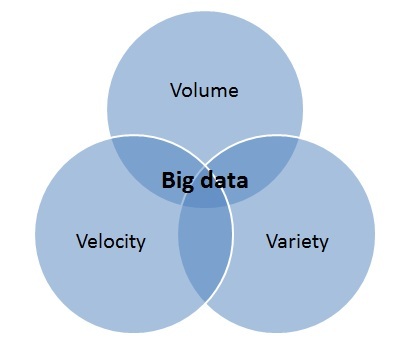 Dubbed the three Vs; volume, velocity, and variety, these are key to understanding how we can measure big data and just how very different ‘big data’ is to old fashioned data. The most obvious one is where we’ll start. Big data is about volume. Volumes of data that can reach unprecedented heights in fact. It’s estimated that 2.5 quintillion bytes of data is created each day, and as a result, there will be 40 zettabytes of data created by 2020 – which highlights an increase of 300 times from 2005. As a result, it is now not uncommon for large companies to have Terabytes – and even Petabytes – of data in storage devices and on servers. This data helps to shape the future of a company and its actions, all while tracking progress. The growth of data, and the resulting importance of it, has changed the way we see data. There once was a time when we didn’t see the importance of data in the corporate world, but with the change of how we gather it, we’ve come to rely on it day to day. Velocity essentially measures how fast the data is coming in. Some data will come in in real-time, whereas other will come in fits and starts, sent to us in batches. And as not all platforms will experience the incoming data at the same pace, it’s important not to generalise, discount, or jump to conclusions without having all the facts and figures. Data was once collected from one place and delivered in one format. Once taking the shape of database files - such as, excel, csv and access - it is now being presented in non-traditional forms, like video, text, pdf, and graphics on social media, as well as via tech such as wearable devices. Although this data is extremely useful to us, it does create more work and require more analytical skills to decipher this incoming data, make it manageable and allow it to work. Big Data is much more than simply ‘lots of data’. It is a way of providing opportunities to utilise new and existing data, and discovering fresh ways of capturing future data to really make a difference to business operatives and make it more agile.